There aren't nearly enough grasses in my garden. Shallow soil and a shady conditions limit them at Clay and Limestone, but, one that is quite happy here and makes a gorgeous big impression is Chasmanthium latifolium (River Oats). I think it's important to tell the truth about plants I showcase and the truth is that I love this one. I planted it for it's year round beauty. This cool season clumping grass is a bright green in early spring, growing quickly to about 2 foot tall and sending up arching stems. A bit later, there are attractive flat, drooping seed heads that hang in terminal clusters on thread-like pedicils on arching stems. 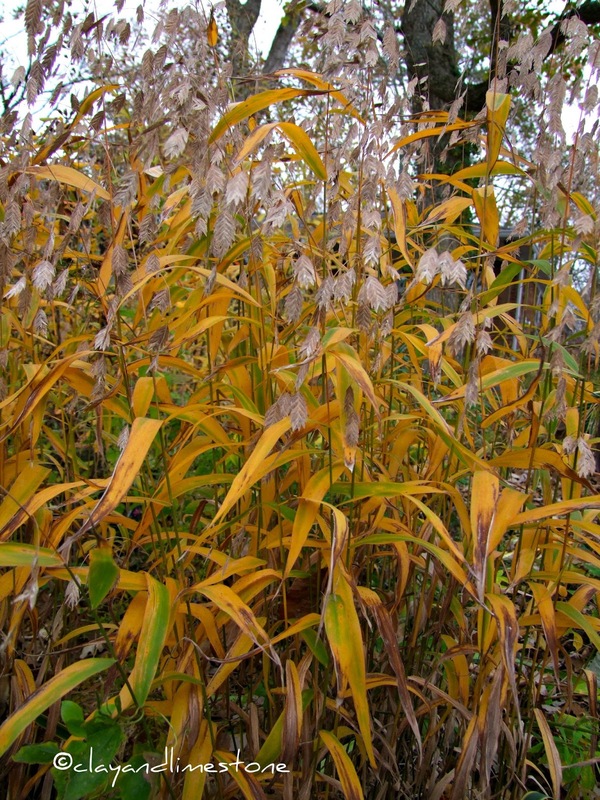 As river oats age they begin to yellow (see above June 2016) and by late summer or early fall the foliage and spikelets have turned a nice bright yellow. By mid winter they're a gorgeous bronze. I leave them stand all winter where they continue to dance in the breeze, stand up beautifully in the snow and provide shelter for small mammals and birds. Way back when Clay and Limestone was just becoming a garden, a more experienced gardening friend exclaimed, "Oh my, why did you plant that?" when she spied a large clump of river oats. 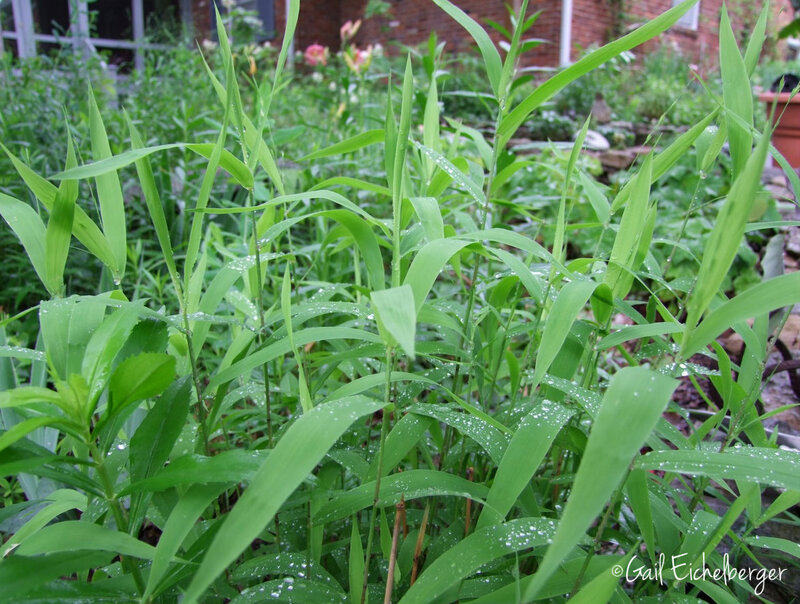 She knew what many of us learn from experience, that river oats can be a bit thuggish in some gardens. 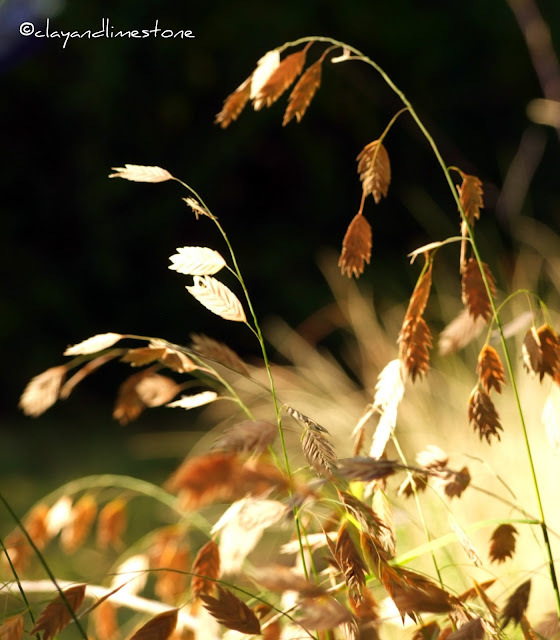 Each and everyone of those spikelets can make a new plant in moist soil. It can in dry soil, too! I love it anyway! But, then, I am a huge fan of colonizing, rough and tumble, take care of themselves native plants. This one has more pluses than minuses, but, plant it only if you don't mind a plant that vigorously reseeds. I've seen it growing in rich woodlands adjacent to cedar glades where it it comingles with Hypericum frondosum, Rhus aromatica and sedges. 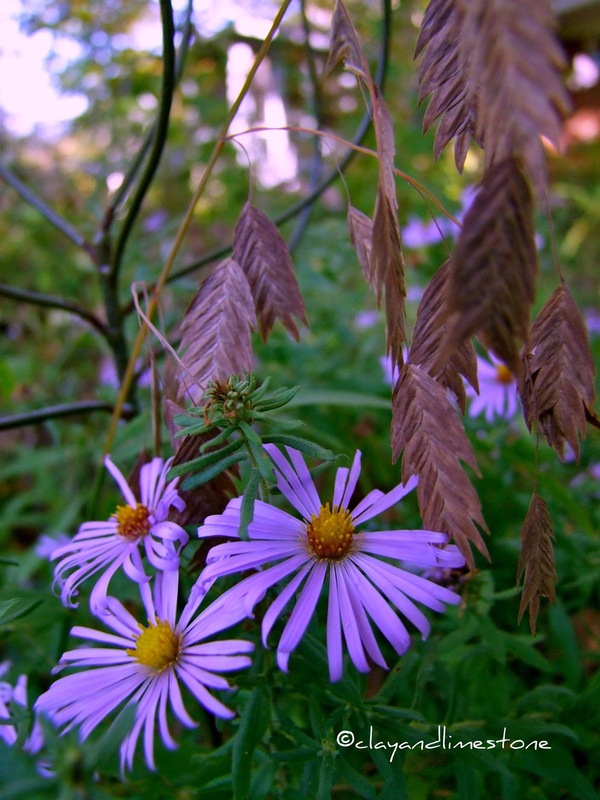 It can also be found naturally growing in rich woodlands and stream beds slopes. It's perfect for stabilizing a stream bank or a slope that's eroding. If you've ever tried struggled to dig a clump to divide or transplant you know that its fibrous and deep root system would hold back the steepest slope! I appreciate its year round beauty...flaws and all. Type: Ornamental grass, River Oats is a perennial cool season grass, but it's seed is dispersed in the fall like a warm season grass. Water: Medium to wet; more water if planted in full sun. It's happy in my garden near the birdbath where it gets a good soaking while I fill the bath or when the birds visit. Wildlife value: larval host for several skipper butterflies. The seeds are eaten by small mammals and birds, and the stems and leaves are used as nesting material by birds. Comments: When happy, it is a rampant self seeder and requires vigilance to catch the seedlings. I would recommend with reservations to gardeners who want their plants to behave. Only you can decide if there are more pluses than minuses! 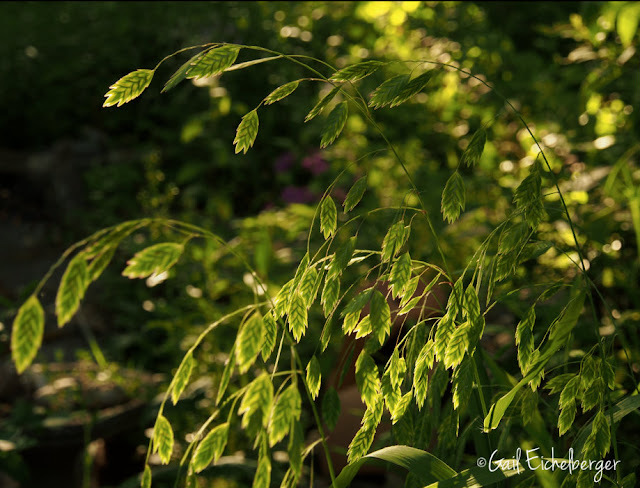 You'll be happy with Chasmanthium latifolium if you can accept its one flaw~vigorous reseeding! Good looking foliage and nodding seedheads that flutter and rustle in the slightest breeze, while providing shelter and food for visiting birds, mammals and insects, more than make up for having to weed out unwanted seedlings! Welcome to Wildflower Wednesday where we come together to celebrate wildflowers from all over this great big beautiful world. It doesn't matter if we sometimes show the same plants, how they grow and thrive in your garden is what matters most. I hope you join the celebration...It's always the fourth Wednesday of the month! I too love this plant. I even cut the seed heads off and stick them into a big vase for winter interest indoors. They are so cheerful. Plus it helps to keep them a little bit in check. You noticed I said "a little bit" in check. ha... But that is just one more thing to love about them. I grew this in Alabama and love it too. I have not planted it here in my new garden yet. I am going to check first to see if it would be invasive here. It was not in AL. I am contemplating this beautiful grass, but my garden is not large and I have wet clay soil. I do seem to love planting wild colonizers though (my secret inner rebel shining through?). I planted anemone canadensis, obedient plant, yarrow and staghorn sumac in what I affectionately call 'aggression corner', I wonder if sea oats would be a suitable companion for this area? 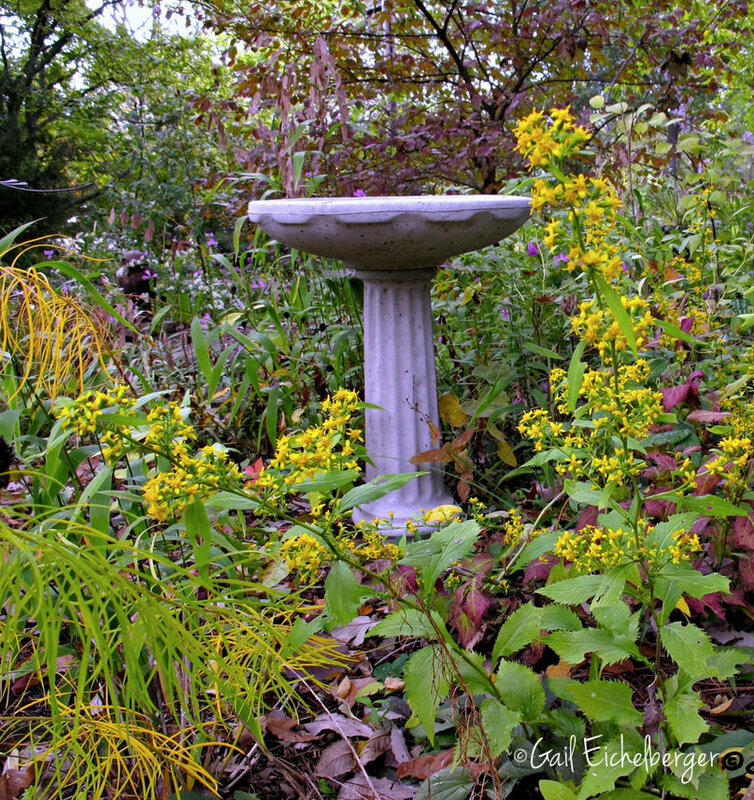 I grow it in dry shade, Gail, and while it does seed itself around a bit, I haven't (yet) found it to be a problem. Mine never grow much taller than two feet, probably because of the site conditions. I agree about the root system, though. I once tried to transplant a clump, and the roots had become so entangled with the Norway maple roots it was quite a challenge! Jury's still out, because it has been with me for less than five years, but so far so good. And, like you, I love those seed heads. I goofed and posted twice. Technology makes me cringe. Anyway, "Hope is on the Way" is a tiny little unopened crocus I found in my yard this week. I had to take a picture. I am in southern middle Tennessee and the weather has been crazy this year so here's hoping spring will really return. I also love my oats, but I have Northern sea oats. This year though I cut them down in the fall. I have enough freebies and did not want to spend time in the spring pulling the volunteers. 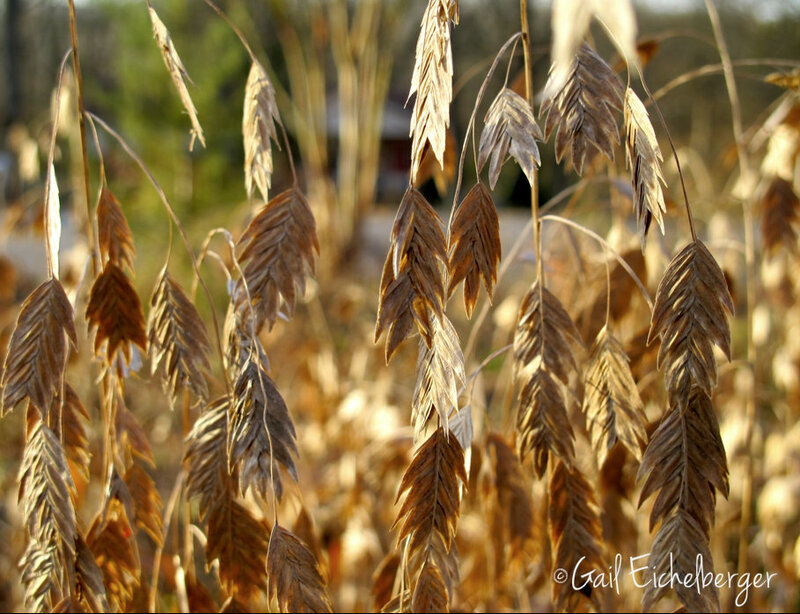 I love looking at River oats but I don't like them in my garden any more. You are braver than most gardeners when it comes to thuggish plants that try to take over the world! I grew river oats in a pot last year, and I did like them very much. But anything that needs to be kept moist is a NO for me and my hot, dry summer garden. I so dislike watering. So I'll just enjoy yours! Lots of lovely grasses to contemplate ! I really love them but find most of them are quite late to get going in my garden. Beautiful photos of your river oats! Thank you for sharing your thoughts on this plant as well. I must admit I have not tried it yet here in Austin, but now that I've read your post, I think I will give it a try. 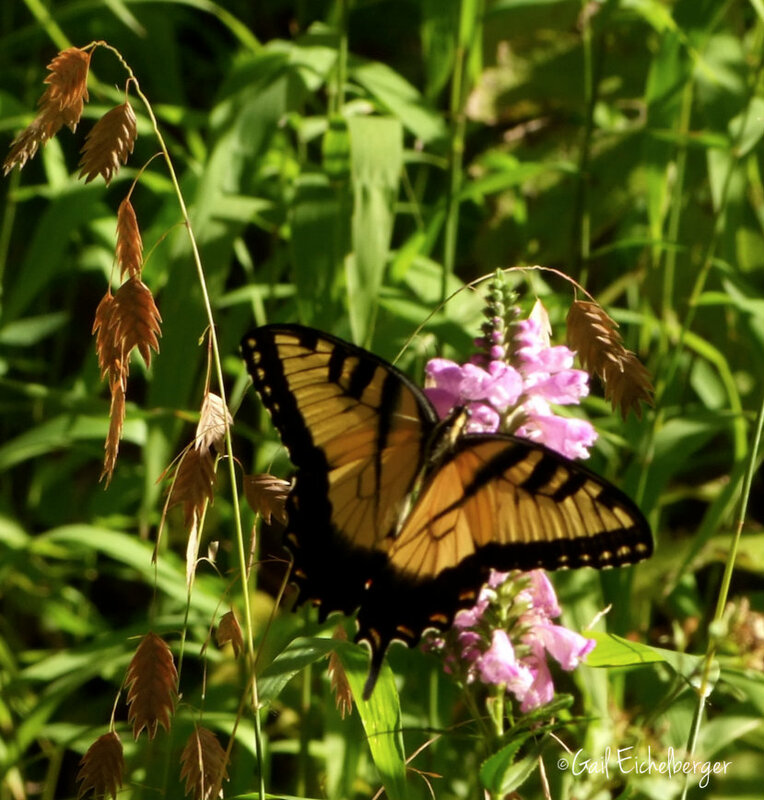 Love the idea of adding a grass that is a host plant for butterflies. Cheers!